Experience. It’s a word that’s becoming more and more ubiquitous, think: User Experience, Digital Experience, Customer Experience, and of course, Content Experience. And for good reason. It’s why for life events like birthdays or anniversaries you’ve probably recently given or received concert tickets, or a subscription box, or if you’re fancy, a trip to somewhere really exotic like Sesame Place (just me?) – instead of the more traditional jewelry or clothing or any other material token of appreciation. Experiences elicit memories that will stay with the recipient for far longer than that watch you got for Christmas last year or the tie you gave your Dad for Father’s Day. 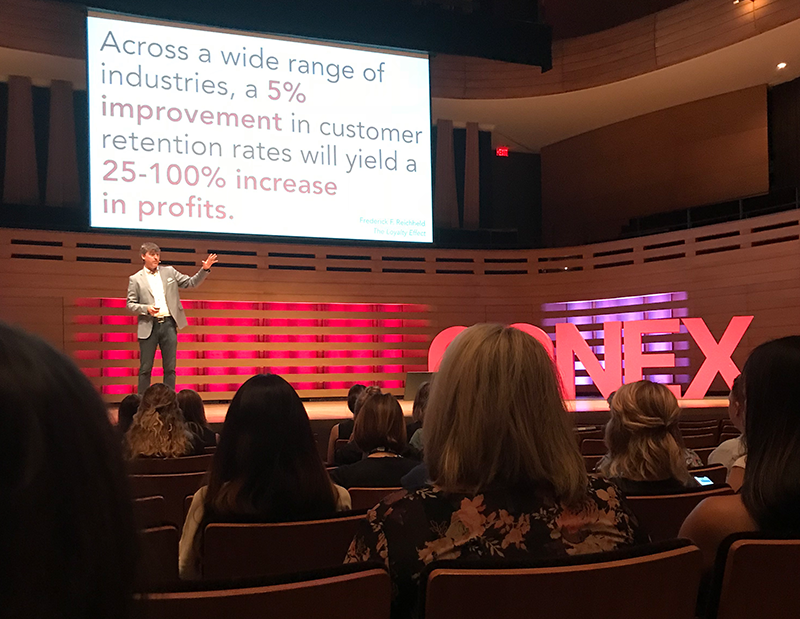 As a Content Experience (#ConEx) first-timer, I thought I’d share some of my favorite highlights and insights that made this an experience to remember. Before I do though, here's a little secret: I almost didn’t go. My colleague was supposed to attend but had to visit a customer at the last minute (now that’s superior customer service, am I right folks!?) 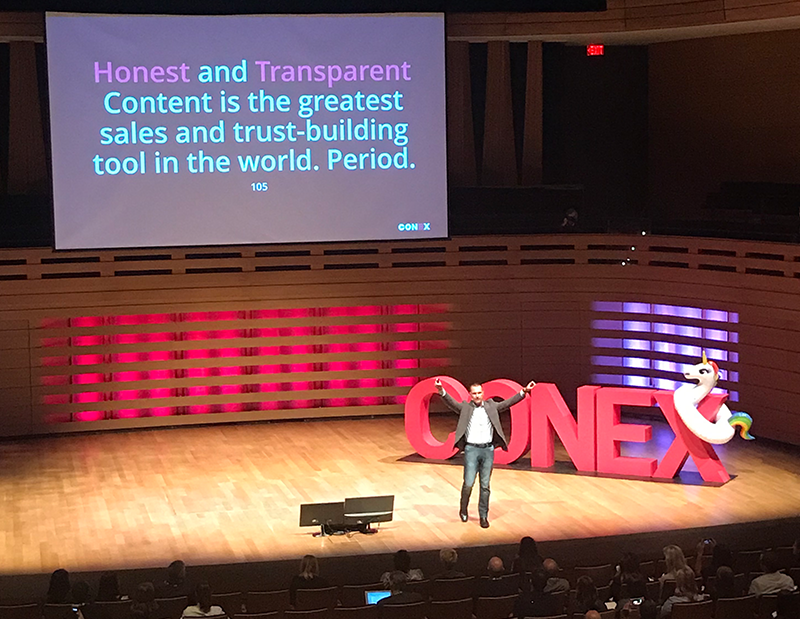 I almost didn’t get to hear from luminaries like Omar Johnson and Matthew Luhn and Amy Landing and Scott Stratten and… the list goes on (and on, and on, and on… that’s my not-so-subtle homage to #ConEx's Choir! Choir! Choir! session). During his session, Joey Coleman - author of Never Lost a Customer Again: Turn Any Sale Into Lifelong Loyalty in 100 Days – told the audience: “There are three types of great speakers: speakers that make you think differently, speakers that make you feel differently, speakers that make you act differently.” Here are some of my favorite insights from the sessions that hit all of those marks (for me). Scott’s the mastermind behind the Nooooooooooooooo button – a one-page website with one, simple functionality (a button that when clicked unleashes Darth Vader screaming “Noooo” – for use in “dire situations”) that generates around 250k visitors every month. Scott talked about moving the needle in your organization with authenticity – marketers can be funny and engaging without making people feel stupid. Most of the time content is being created for you, you just have to listen for it and grab it. Case in point? When one of Scott’s blog posts exposed Canada’s top communications company for astroturfing, aka getting employees to write fake reviews, for its mobile app – that resulted in a $1.25 million penalty. Scott’s session was so entertaining that I’ve already started listening to his refreshingly honest podcast he hosts with wife, Alison Kramer. You can check it out here: The UnPodcast: Business Podcast for the Fed-Up. I'd be remiss if I didn't include Marcus, aka the Pool Guy aka the Sales Lion, on my short list. Marcus' high-energy session focused on the secret to becoming the most trusted voice in your space: obsessing over your customer's questions. Seem simple enough? He pointed out the key topics that move every buiying decision (in every industry, period), concentrating mostly on the subject that buyers really care about: cost. If a prospective customer is researching your website and can't find any pricing information they will leave your site after only 10 seconds. A common theme throughout #ConEx? Authenticity. Marcus argued that honest and transparent content is the greatest sales and trust-building tool. The moment a buyer feels like you are hiding information from them - trust is gone. To learn more about how you can incorporate sticky content on your website like pricing (even in a business model like consulting that offers customized solutions) or the other four subjects that move the needle in every industry, check out Marcus' book on Amazon: They Ask You Answer: A Revolutionary Approach to Inbound Sales, Content Marketing, and Today's Digital Consumer. Anyone who can bring an entire theater to their feet to participate in a flash mob version of the “in my feelings challenge” and, more impressively, makes a crowd feel excited about electronic signature technology deserves a spot on this list. Caitlin, the Global Social Strategy & Operations at DocuSign, focused on a relatively new social feature in Facebook Live – and how businesses can leverage the algorithm-favoring element to connect with customers and potential customers. On Facebook, 50% of data traffic is video, 40% of total video watching comes from shares, and 1 in 5 videos are Live. Facebook’s algorithm gives an advantage to Live video above other pieces of content, and it fosters engagement more than any other. Just don’t confuse Facebook Live with TV. It’s meant to be interactive (think, answering your audience’s questions as they pour in), immediate, and immersive. You might have heard of a little company called Pixar. Matthew Luhn, got his start as the youngest animator on The Simpsons at just 19, and more recently, worked for the Disney subsidiary crafting stories like Toy Story, Finding Nemo, and Up. Matthew spoke about the science of good storytelling: weaving your company pitch around highs and lows that release dopamine and oxytocin (respectively) to keep the audience feeling happy and invested in the outcome. In the end, people aren’t going to remember what you said or did, they are going to remember how you made them feel - good storytelling is all about making people feel something. He concluded the session by showing a perfect example of a company achieving just that in Always’ Like a Girl Commercial – and if you haven’t seen it before – grab the tissues (fair warning). So much for a quick recap post. Hopefully this gave you somewhat of an insider’s look at Uberflip’s Content Experience. 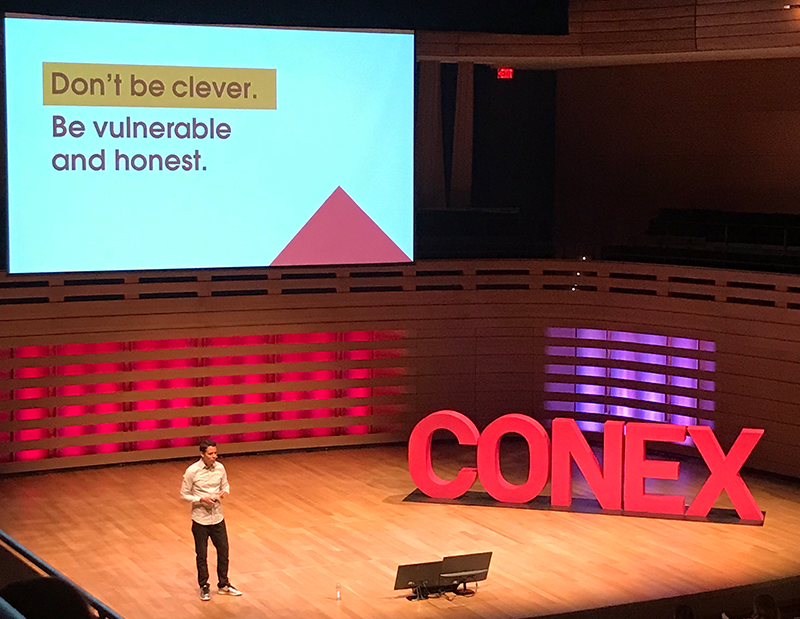 I’d love to hear what you thought if you were also at #ConEx. Did you have different favorites? Head on into the comment section below or email me directly at caroline@function1.com.